1. Cooking time: 40 minutes. 2. Preheat oven to 200 ᵒ C. Well with salt and pepper fillets on both sides. 3. Heat a frying pan and fry fillets on both sides until confident Golden brown. 4. In the cream, squeeze the garlic, add the mustard and thyme leaves, season with a little salt and pepper, mix well. 5. Grate the cheese on a small grater. 6. Put the fried fillet in a baking pan. 7. 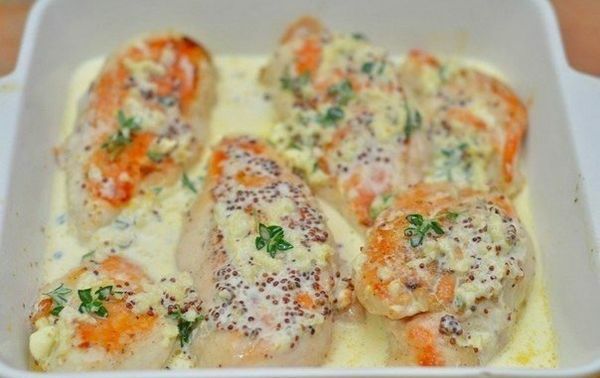 Pour fillet with cream sauce. 8. Sprinkle cheese and put in the oven for 20-25 minutes. The main thing is not to overdo fillet so that it remained juicy. 9. Fillet ready. Serve immediately while it’s hot!